Yes! The rebels are none other than Tsunami. Utter the word ‘Tsunami’, and one tends to go back down the memory lane of 26th December, 2004 that devastated the shores of parts of India. This natural disaster is cataloged in worst of its kind in the modern history. It was an undersea earthquake of magnitude 9.1 on the Richter scale in the Indian Ocean that generated the Tsunami. This particular Earthquake is rare and occurs approximately every 300 years as quoted by Discovery Channel, “Unstoppable Wave”. Tsunami is a Japanese word with the English translation ‘harbour wave’. “Tsu” means “harbor”, while “nami” means “wave”. Large scale disturbance of the ocean such as earthquakes, landslides, volcanic eruptions, explosions, meteorites etc are the cause of gigantic waves. These disturbances can either be from below (e.g. underwater earthquakes with large vertical displacements, submarine landslides) or from above (e.g. meteorite impacts). Tsunamis are obviously waves and hence they have a wavelength. The wavelength is the length from crest to crest, and wave-height is the distance from the bottom of the trough to the top of crest. A vertical displacement in the water column as a result of underwater earthquake in the sea becomes Tsunami. where, g is acceleration due to gravity and H is the depth of water. The amplitude of the tsunami is determined by the amount by which the sea-floor is displaced. In the deep ocean, the typical water depth is around 4000 m, so a tsunami will therefore travel at around 200 m/s, or more than 700 km/h, approximately equivalent to the speed of a jumbo jet. As Tsunami leaves the deep-water of the open-ocean and travels towards the shallow water near the coast, the waves slow down, approximately to the speed of a cyclist. 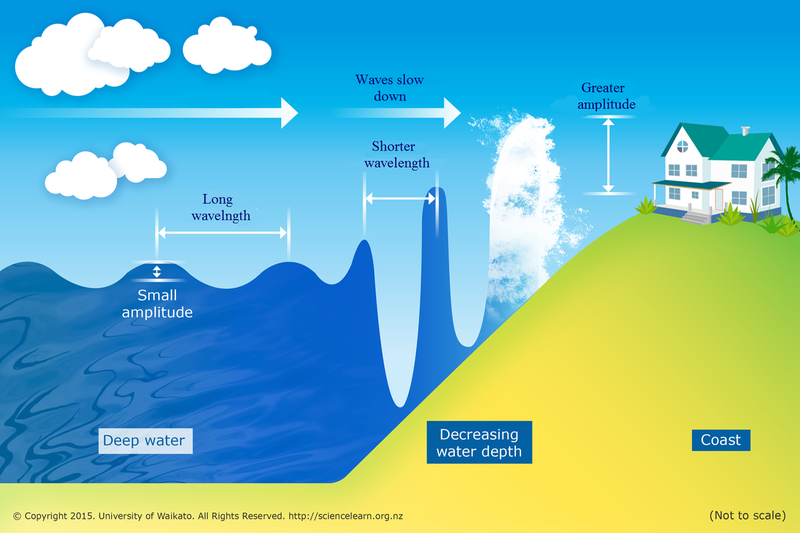 As the depth of the water reduces, speed and wavelength diminishes and therefore, energy per unit area has to increase. So, the wave height increases to several meters near the coast. This is called SHOALING EFFECT. Shoaling is a phenomenon that arises when the waves moves from deep water to shallow water i.e., nearby the coast. The waves experience force from the seabed in shallow water. As a result group velocity of waves becomes smaller, wave energy per meter increases. Hence, the wave steepens with short steep crests and broad shallow trough. When wave slope at the crest becomes sufficiently steep, the wave breaks and reaches the shore with horrendous effects. As a precautionary measure when the warning sign of Tsunami is issued, going to higher grounds is very effective for the individuals. And you thought Tsunami is called “tidal waves”, “seismic waves” or even a storm surge? A BIG NO! These are altogether different phenomena. Tidal waves result from gravitational influences of the moon, sun and planets; seismic implies an earthquake generated mechanism but, Tsunamis is also as a result of non-seismic event, such as landslide or meteorite impact; storm surge is a rapid rise in coastal sea-level caused by tropical cyclones.